Solucpro, provider of professional audiovisual solutions, has excellent distributions of professional audiovisual products. We facilitate the work to all those who want to promote in video, economically and easily, their brand on the network. In this case, a suitable work platform is presented to emulate television productions. It is a solution that not only responds to the demands of issuing and editing, but also monetization. Also it is a complete audiovisual system for all customers. 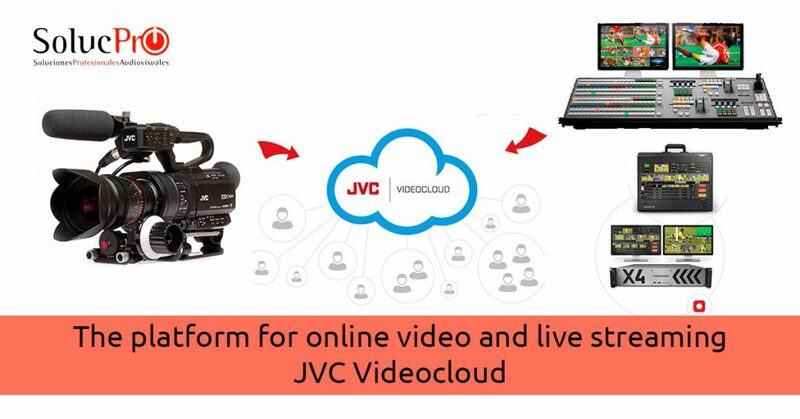 JVC Videocloud is the low cost platform for the ideal television production. Thus, the client will have its own work platform for online video and live streaming. It is not easy to find a complete audiovisual system that is adapted for all audiences, especially in the economic or technical field. With JVC Videocloud you will enjoy as if you were the director of a television network. There are: a selection of cameras; speeds; repetitions; recordings … A multifunctional system to make the video your hallmark. Among those that stand out broadcast through the streaming emission in the cloud, in multiple venues and with a wide possibility of diffusion. To this is added the possibility of allowing access rights, administration to different video libraries and the logical personalization of content. Reach all your audience through broadcasts around the world. Customize your broadcast at 100%: levels of image quality, different cameras and plans to offer continuously. Who can use JCV Videocloud? It is primarily intended for both small businesses and independent production. However, to be aware of the potential of this platform, it was used by the Slovakian Ministry of Foreign Affairs in the commemoration of the Slovak Presidency of the Council of the European Union. It goes from the recording of an event and its subsequent dissemination to the calculation of metrics and viewings. This makes it possible to create and maintain your own online channel to disseminate the most relevant audiovisual content. Get a personal brand in unmistakable video and offer unique viewing experiences to your users. JVC Videocloud is not limited to broadcast. In addition, it collects relevant data from your viewers, such as the number of viewings, the device from which it is being played and the region in which it is located, among many other interesting statistics. These metrics allow you to know in depth your audience and know the best way to reach it. In fact, it includes an option to connect it to Google Analytics and further detail all types of audiovisual results analysis. At present, knowing your audience is the key. In addition, you can monetize your recordings and broadcasts, since the platform itself includes banner insertion, advertising and configuration of the website itself. Not only you will achieve an exceptional transmission in the matter of video, but also you will know your audience and you will be able to offer the best audiovisual results, as well as earn money with your transmissions. Now professional video and audio will no longer have mysteries for you. With JVC Videocloud you can make your own television productions at low cost and as a professional.